When Rich came to our office about 6 months ago, he weighed 320 pounds; he was tired all the time and was falling asleep at his work desk. According to his wife, he snored loudly all night and stopped breathing many times. He could not climb one flight of stairs without huffing and puffing. Rich started the Optifast program in June of this year and has successfully lost almost 80 pounds to date and is still going strong! 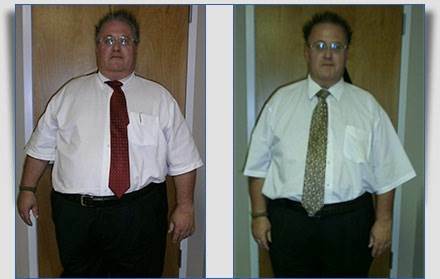 He transitioned off the Optifast in September and is now on a low carb diet. I am happy to report that he has a lot more energy- he goes to the gym every day and successfully climbed 6 flights of stairs at work last week. His wife cheerfully states that he does not snore anymore. Needless to say, the Optifast program has changed Rich’s quality of life. He is now leading a more happy, productive and energetic life! Rich came to our office about 6 months ago, he weighed 320 pounds; he was tired all the time and was falling asleep at his work desk.